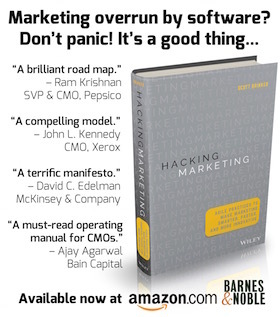 I’m the author of the book Hacking Marketing: Agile Practices to Make Marketing Smarter, Faster, and More Innovative published by Wiley. My goal was to help marketers at all levels — even those with no technical background or inclination — adapt marketing management to the wild and wonderful whirlwind of a world now dominated by software. My underlying thesis: as marketing becomes more and more entangled in software — as everything becomes more and more digital — the art of managing marketing increasingly resembles the art of managing software. For most people, that probably sounds a little strange. After all, marketers and software developers have historically been on opposite ends of the career spectrum. But when you realize that marketers are now paddling water up to their chins in websites (software), analytics (software), social media (software), marketing automation (software), interactive content (software), mobile apps (software), and so on, it starts to seem obvious. Software has eaten the world — and marketing too. And this is actually a really good thing. Software gives us the potential to innovate and scale marketing in highly agile ways that defy the conventional laws of gravity as we knew them in the classical marketing universe. But it’s like the leap from Newtonian physics to quantum mechanics — the “rules” of what’s possible are different and can feel a little counterintuitive. To effectively harness the digital forces of software, we must not only innovate what we produce in marketing, but innovate how we produce it too. 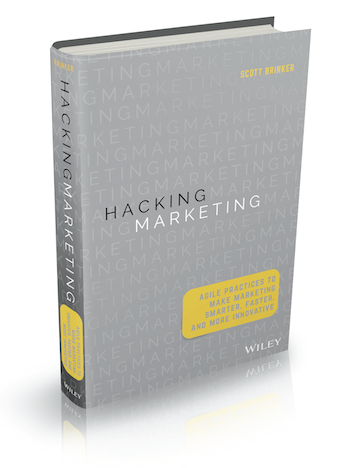 If this sounds intriguing to you, you can download the introduction, table of contents, and first chapter of Hacking Marketing as a free PDF. It describes the basic framework of the role and the forces that are motivating the growth of hybrid marketing/technology executives, and it also provides short vignettes of five real-world marketing technologists. I contributed a chapter to the book Multi-channel Marketing Ecosystems, edited by Markus Stahlberg and Ville Maila. As part of their promotion for the book, the publisher has agreed to let me distribute a PDF of my chapter that discusses software as the new fabric of marketing — Software-driven marketing ROI. Click the previous link or the image to the right to download your free copy (no registration required). CMS Wire — CIO Reports to CMO: Technology Under Marketing? Who’s Afraid of the Big Bold Test? Have You Adopted Agile Marketing Yet? And, of course, I also contribute posts to ion interactive’s blog, which I might add contains many great pieces from some of the most amazing post-click marketing experts I know.